AvM uses a divers pallet to search for the position of artisanal skills in the modern day world. “We strive towards minimalism and simplicity; it’s a search for timelessness”. 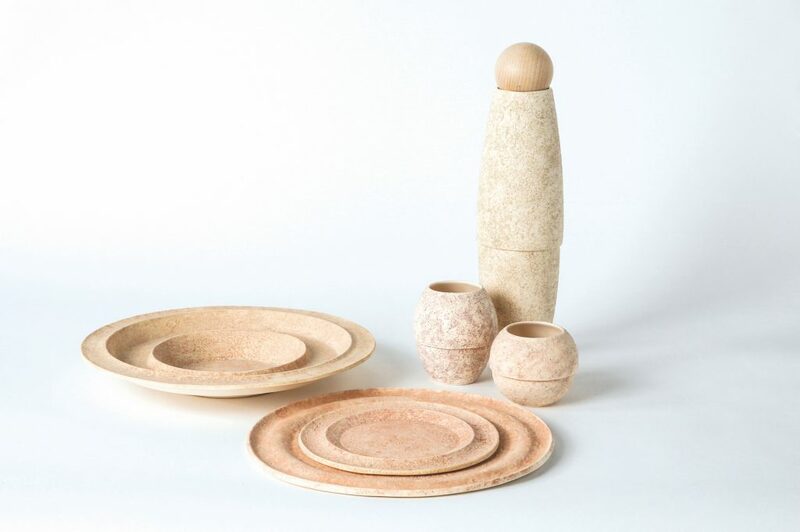 Through several objects AvM tells a story using material as a medium, and makes history tangible. CH#01 aims to be simplistic and minimalistic as can be. 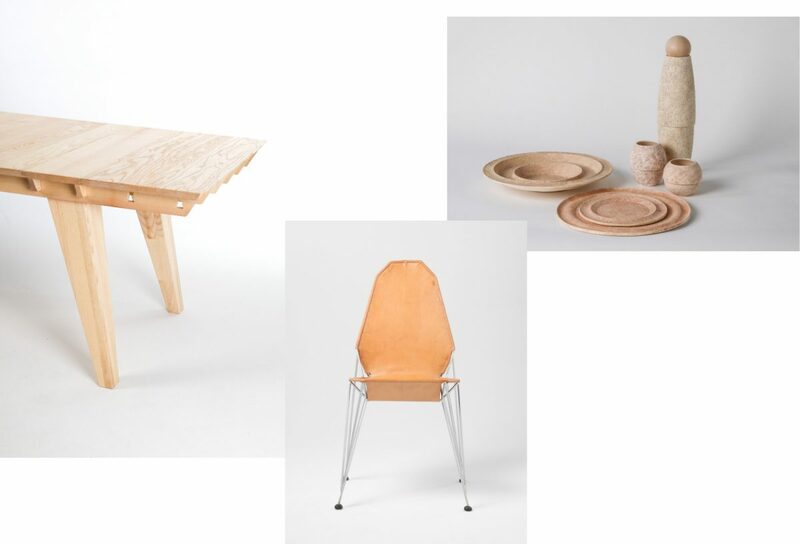 The chair is, next to a search for minimal and responsible use of materials, a search for timelessness. The chair is made of an aluminium skeleton stretched over with uncoloured saddle leather. Partly modern in its materiality and design, but traditional in its pure material use and the techniques used to attach the skin to the skeleton. A manual process which runs counter to the shape of the modern frame. 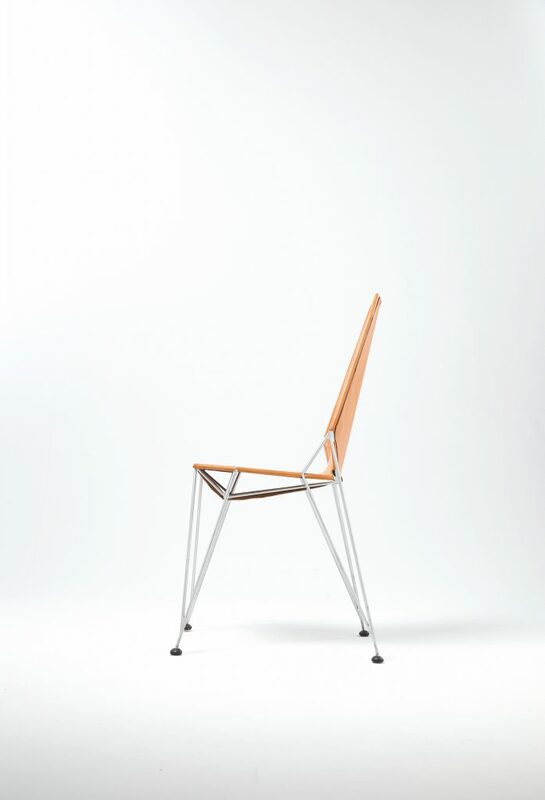 The use of aluminium means that the chair has the same strength as steel but weighs a fraction of a steel version. In addition to this, aluminium generally is partly made from recycled aluminium and has lower emissions to be created or recycled. 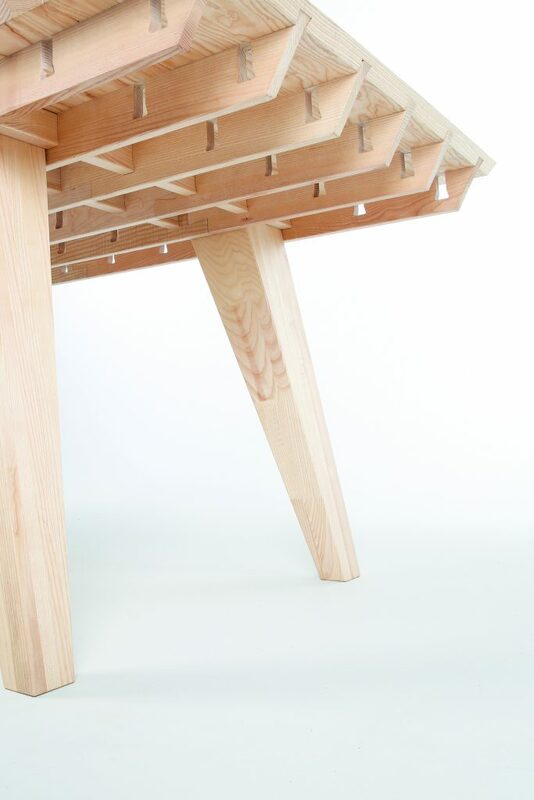 CH#01 is not only physically light by its use of materials but also visually by its open structure. In its detailing it uses old techniques and materials that are known from making horse saddles. The location of my studio offered me the inspiration for this use of materials. The veehal where you can find my studio is located on a street where once there was a weekly cattle market. This cattle market, together with the markets of Den Bosch, Leeuwarden and Utrecht, belonged to the largest of the Netherlands. In 2001 there was an unexpected and sudden stop to the cattle market, due to government measures. It was the end of at least 7 centuries of cattle trade in Zwolle. CH#01 is not only a tribute to the ancient craft but also a to the centuries old history of Zwolle. T#01/M2-table spawned from the location of my studio. The oldest veehal in the area where I am located has a beautiful wooden structure on its inside. It is a combination of various simple techniques to build with wood. Dutch and Japanese wood connections inspired me to set a mission for myself. 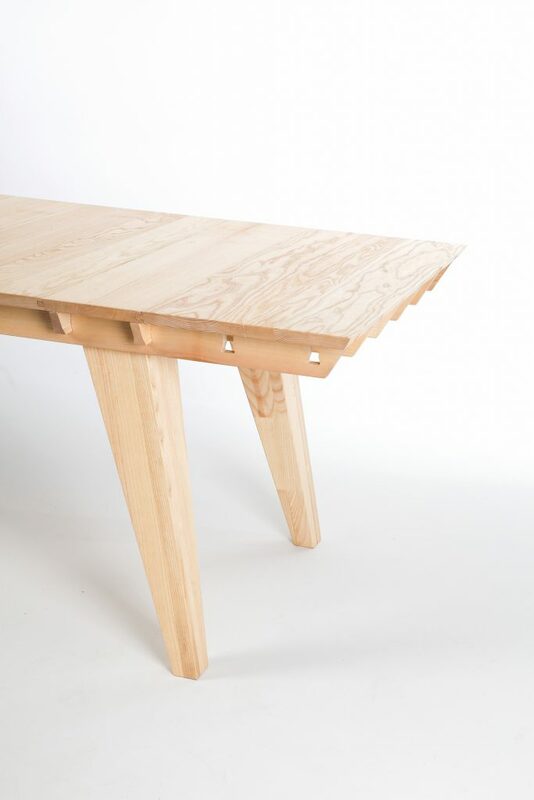 Design a table without glue, screws or other additives. In Japan and the Netherlands people managed this centuries ago with houses. A table should definitely be possible. I wanted to set another goal, besides the process of making. The length…. What would be the ultimate limit without the use of glue, nails, screws or other additives? In times where many large tables are made, I found that this table had to be larger. 7 meters is the ultimate goal. T#01 was a search for the maximum capacity of artisanal skills. An ode to Dutch and Japanese craftsmanship. A search for timelessness, a design that inspires for a long time of usage over several generations. 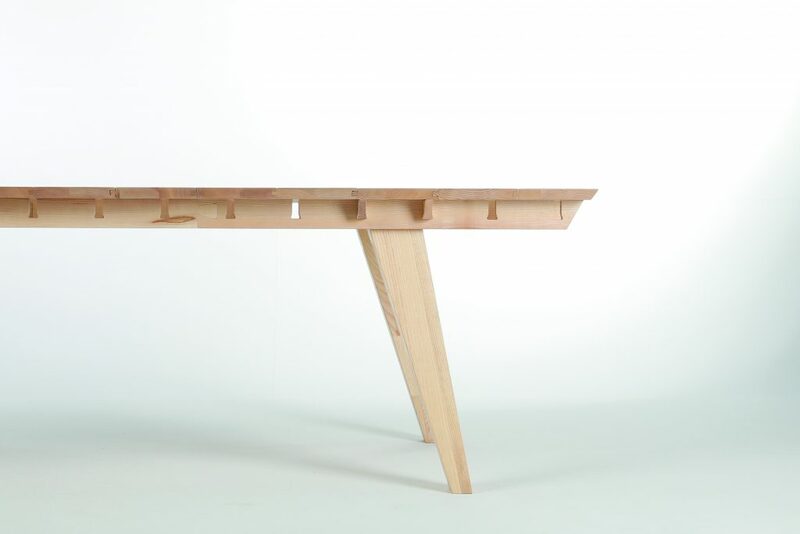 T#01 holds itself together, without glue, screws or other additives. T#01 can grow/shrink per m2. This means that this can be your first table in a dorm room and that it can grow to five metres long family table where you, in the years to come, sit down with children and grandchildren. A table for life. The Hanseatic League was officially founded in 1358 and has a rich history. It didn’t only left behind traces of economic trade but also mutual political interests. It was one of the first ways to unify European countries. Boundaries were not important. This is what I wanted to explore through Hanzeware. It is a new insight into one of the oldest institutions of Europe. It was a search for a simple formal language, which is clearly a family. The shape facilitates the passing of the crockery. Crockery as a symbol for the passing of goods. It creates an intimate form of space between two bodies during the passing. The link with the cities is strengthened by the using of locally mined sand from eight of the most important cities in the Hanseatic period. It is used as a glaze. The material provides a sense of belonging, because there is a part of the city itself in each piece of crockery that will be made. The skin varies per item, but below it is the same porcelain. Just as people differ from the outside, but on the inside we are all the same. Hanzeware is a discussion about whether to open or not to open up our borders to outside influences. This is what needs to be discussed and celebrated. Being united and connected despite our differences. 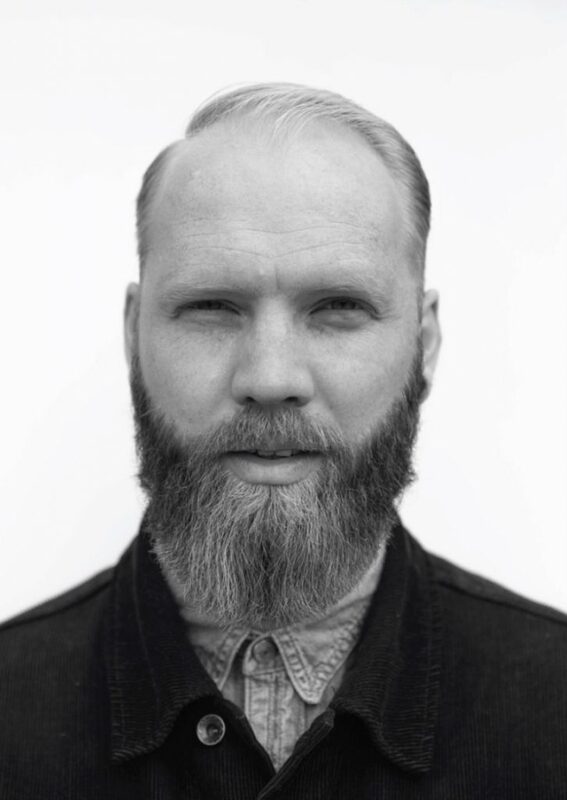 Robert van Middendorp founded Atelier van Middendorp in 2014 after getting his masters degree in In_architecture at ArtEZ University of the arts in Zwolle. Robert van Middendorp (1987) puts great value on experiencing the entire process of creation himself. “This is what is required of me as a designer, to get the hang of it, design doesn’t only come from the head, but from the hands as well”. Robert completed internships at various masters of different disciplines in order to expand his skill set and to hone his craft. He continues to sharpen the knowledge he accumulated during this period, as well as striving to always learn new crafts to stay ahead of the industry. However, his dedication to mastering age-old crafts, created a body of work that has a clear link to tradition. The various techniques he uses often comingle and cross borders and disciplines that create a fusion of creation. Robert’s work embodies a search for the aura of the maker. Robert often delves into previously unexplored areas of design where he drinks in the knowledge he acquires to implement innovatively in his own work. This passion for new knowledge and the blending of different disciplines results in a refined sense of materiality and technique. The sheer time and artisanal research that Robert pours into a project always ensures a product where the physical and the spiritual meet. Despite the vast amount of disciplines and techniques Robert implements in his work, his entire body of work remains grounded in a search for timelessness. The search for timelessness lends certain uniformity to his body of work. The search for timelessness in architecture, interior, and design is a search for a form of sustainability that transcends the concept. I agree to my personal data being processed and stored.